Members and friends of the Santa Maria Valley Railway Historical Musuem (SMVRHM) were indeed privileged to get this opportunity to view this collection. If you missed this trip, DO NOT miss your next chance! Here's the view as you entered the train room. 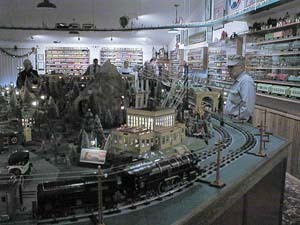 But before entering the train room, visitors are greeted with this jam-packed post-war Lionel layout built on a restored railroad baggage cart. 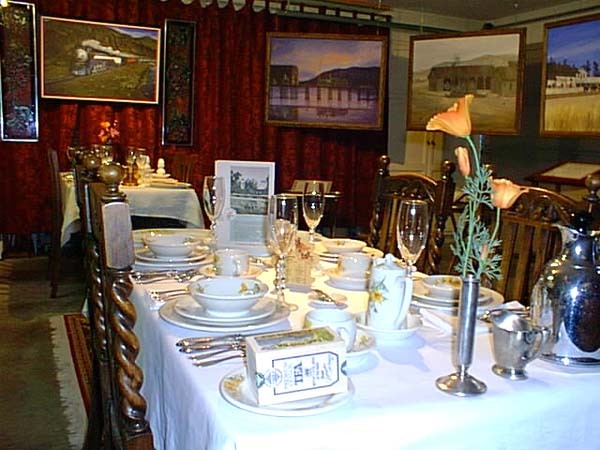 In the same "greeting room" are two dining room tables set with authentic china, stemware, and linens. 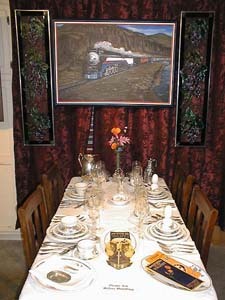 This table is for Southern Pacific cuisine. And this one is for Sante Fe cuisine. 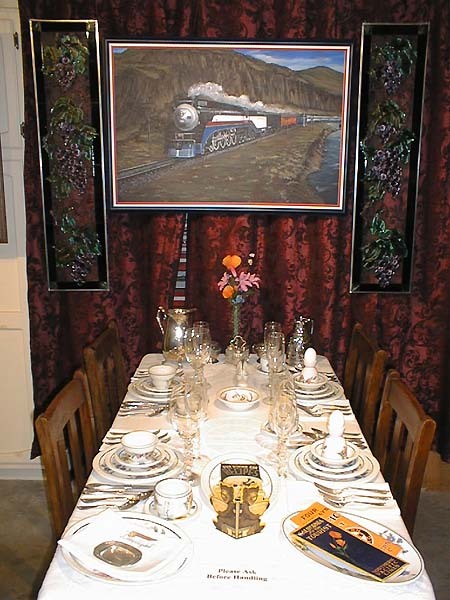 The artwork in the background and throughout the train room was done by Wayne Scarpaci, good friend of our host. 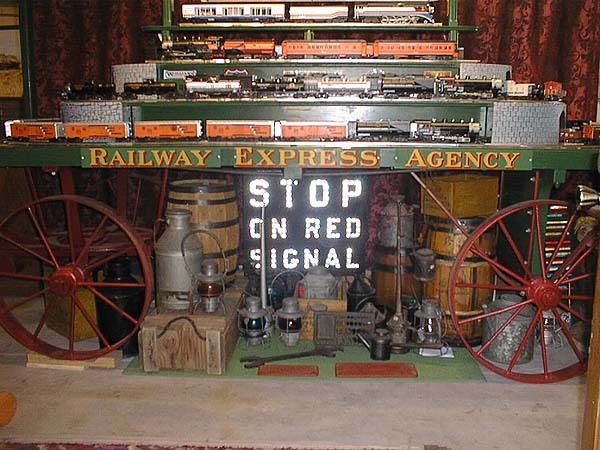 The first layout you encounter in the train room is an O-gauge Lionel set built upon yet another baggage cart. 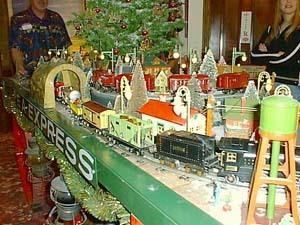 The red train in the higher, center portion of the layout has run every Christmas since the children of the house were born - 40 years! 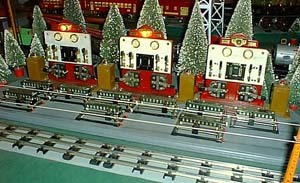 The larger of the three layouts in the train room is a standard gauge setup. 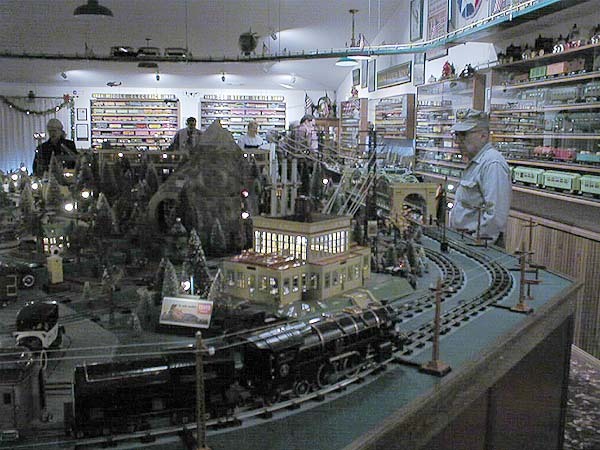 Nearly every item on the layout, and much of the power and control equipment not visible, are the genuine articles as seen in pre-war Lionel catalogs. Among the more impressive single accessory items is this 5-unit standard gauge roundhouse - all original including the paint! Here's a longer shot of the roundhouse end of the standard gauge layout. 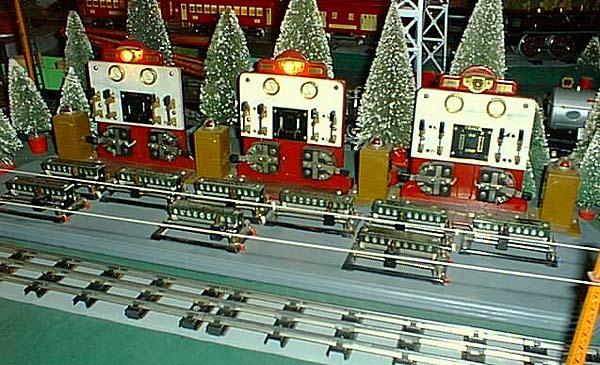 Standard gauge was started in 1906, and was last seen in the Lionel catalogs in 1939 (no new products after 1936). Today there is some standard gauge being offered once again: Hiawatha and a NYC Commodore Vanderbilt. Here's a longer shot of the roundhouse end of the standard gauge layout. 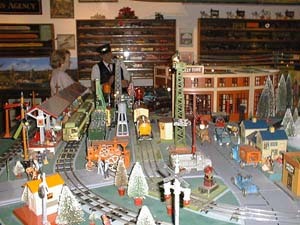 Another long view of the standard gauge layout. 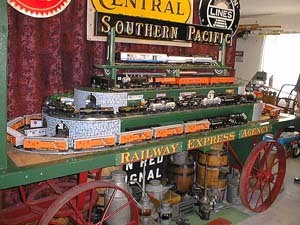 This picture also gives you a feel for the number of Lionel trains on display in wall cases around the room. Also, note the trolley line suspended from the ceiling (a little more on that later). While the trains are generally operated by computer, they are setup to be run manually as well. This control setup allows three voltages per block: startup, running, and slow down. Note that the indicator bulbs are on (trains are active) in the left and center blocks, but not the right block. 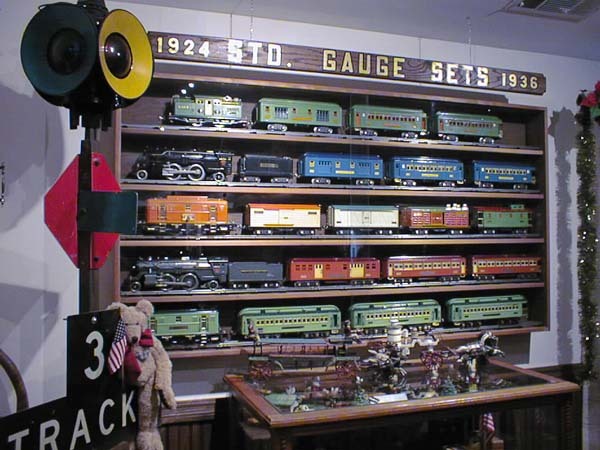 This wall case contains standard gauge Lionel trains from 1924 through 1936.